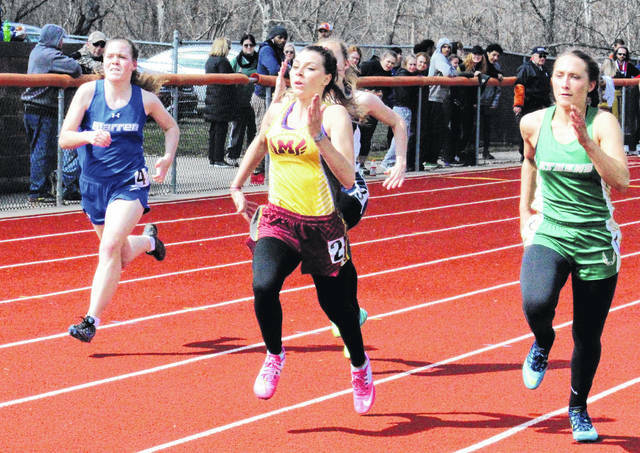 Meigs junior Kassidy Betzing runs past a trio of competitors in the 100m dash at the Rocky Brand Invitational on March 31 in Nelsonville, Ohio. 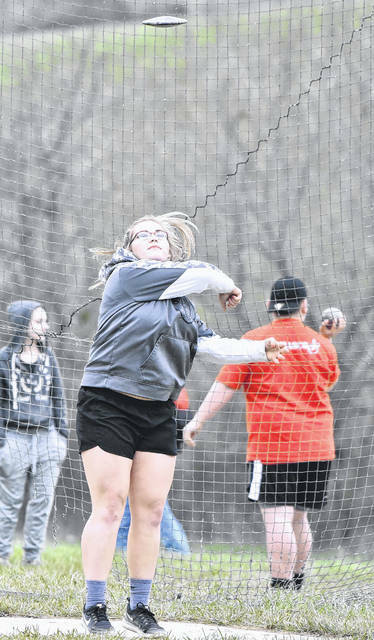 River Valley junior Kelsey Brown releases a throw in the discus event at the 2018 Gallia County meet held Tuesday, April 10, at Gallia Academy High School in Centenary, Ohio. VINCENT, Ohio — The track and field teams from Meigs, River Valley and South Gallia combined for six individual titles and 27 top-four finishes on Saturday at the 2018 Warren Invitational held on the campus of Warren High School in Washington County. Meigs came away with four individual championships and nine top-four efforts, while River Valley earned a pair of titles and 16 top-four efforts. South Gallia had only two top-four finishes overall, one on each side of the competition. Warren won the girls championship with 159 points, with Morgan (80) and River Valley (60.5) rounding out the top-three spots. Meigs was fifth with 49.5 points and South Gallia was last of 11 squads with eight points. The Lady Raiders’ lone title came from Kelsey Brown after a throw of 35 feet, 1 inch was enough to claim the shot put championship. Kenzie Baker was the 3200m runner-up (13:47.8) and also finished third with a mark of 6:12.60 in the 1600m run. Alyssa Lollathin placed third in the triple jump (26-2½) and placed fourth in the 300m hurdles with a mark of 54 seconds even. Jenna Burke landed a pair of fourth place finishes in the pole vault (7-0) and high jump (4-6) events. Gabrielle Gibson was fourth in the 100m hurdles with a mark of 19.35 seconds, while Savannah Reese was fourth in the 400m dash with a time of 1:06.80. Gibson, Reese, Sarah Moffett and Evalena Ehman also finished fourth in the 4x400m relay event with a time of 4:45.50. The Lady Marauders came away with three event titles and a quintet of top-four efforts, as well as the top-point scorer in the girls meet. Kassidy Betzing netted 24.5 points for the Maroon and Gold, which included a pair of championships in the long jump (16-10½) and triple jump (30-3) events. Taylor Swartz was also third in the long jump with a leap of 14 feet, 11 inches. The quartet of Betzing, Swartz, Madison Cremeans and Lydia Edwards won the 4x100m relay with a time of 54 seconds even. Betzing, Swartz, Edwards and Madison Fields were also second in the 4x200m relay with a mark of 1:55.20. Olivia Harrison accounted for the all of the Lady Rebels’ points after placing second in the 100m hurdles with a time of 18.89 seconds. Warren also captured the boys team championship with 134 points, with New Lexington (100) and Philo (61) rounding out the top-three spots in the 11-team field. The Raiders were fifth overall with 50 points and the Marauders were ninth with 30 points, while the Rebels placed 10th with four points. Eric Weber came away with River Valley’s lone title after winning the discus event with a throw of 141 feet, 8 inches. Ty VanSickle was the shot put runner-up (41-8), while the quartet of Kyle Coen, Nathaniel Abbott, Brandon Call and George Rickett was second in the 4x800m relay with a time of 8:49.80. Abbott was the 3200m runner-up with a mark of 10:51.50 and also placed third in the 800m run (2:08.60). Rickett was fourth in the 3200m run with a time of 11:31.10. Bailey Caruthers secured Meigs’ lone title in the high jump with a winning leap of 5 feet, 10 inches. Devon Hawley was the high jump runner-up with a cleared height of 5 feet, 8 inches. Matthew Jackson was also the discus runner-up with a heave of 139 feet even. The quartet of Hawley, Lane Cullums, Theo McElroy and Zach Bartrum completed things for MHS with a fourth-place time of 47.20 seconds. Kyle Northup accounted for South Gallia’s lone top-four effort after finishing fourth in the high jump with a cleared height of 5 feet, 8 inches. Visit baumspage.com for complete results of the 2018 Warren Invitational held Saturday at Warren High School.